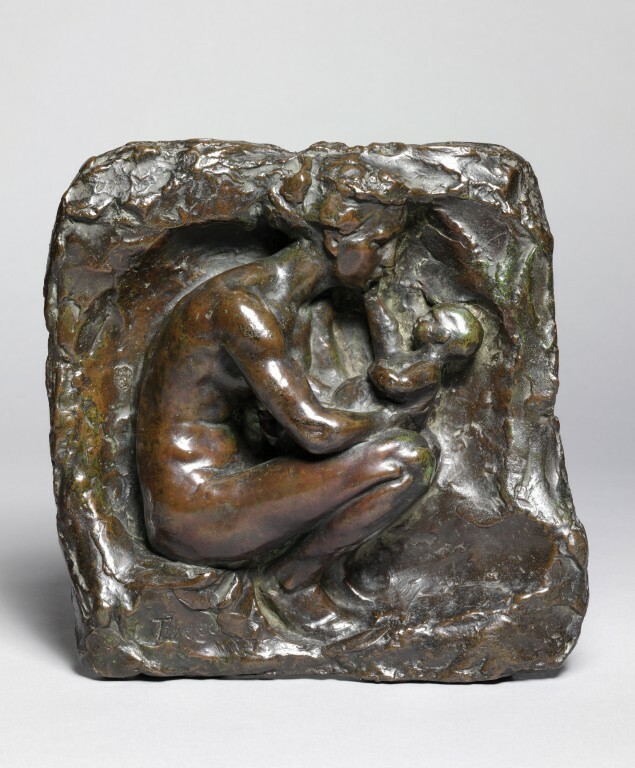 The composition of John Tweed's bronze is inspired by and closely resembles in form, content and spirit, Auguste Rodin's The Young Mother for which the Museum holds a plaster sketch (Museum no. A.25-1924). Tweed admired Rodin's work greatly and was a staunch supporter of Rodin in England. He visited him over many years and became known as the 'English Rodin'. Tweed played a vital role in raising funds by public subscription to purchase the monumental bronze St John the Baptist by Rodin for the Museum in 1902 (Museum no. 601-1902) and negotiated with the Museum over Rodin's gift in 1914 of eighteen of his finest works. Tweed and his family frequently stayed at Rodin's studio in Meudon, the Villa des Brillants, and Rodin stayed with the Tweed family in Chelsea when visiting London. The naked mother, seated at the left and shown in profile, gazes at her naked baby which she holds directly in front of her, her arms supported on her thighs. Both figures are set in a grotto-like surround. The rectangular relief stands on two bronze supports. These appear to be of the same date as the object, but cast separately and fixed to the base of the relief. 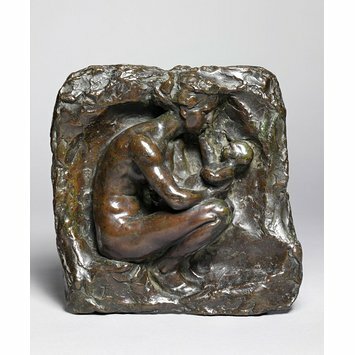 The composition of Tweed's bronze is inspired by and closely resembles in form, content and spirit, Auguste Rodin's The Young Mother. The Museum has a plaster sketch of Rodin's composition (Museum no. A.25-1924), bequeathed to the Museum by Sir Claude Phillips. This relief was purchased for 4,800 in 2005. This bronze demonstrates Rodin's influence on the next generation of sculptors, many of whom visited his studio in Paris at the end of the nineteenth century and beginning of the twentieth.